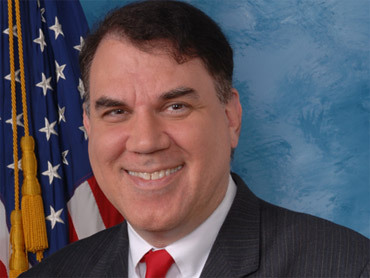 Democratic Rep. Alan Grayson of Florida has apologized for calling an adviser to Fed Chairman Ben Bernanke a "K Street whore." "I offer my sincere apology to Linda Robertson, an adviser to Fed Chairman Ben Bernanke," Grayson said in a statement emailed to reporters. "I did not intend to use a term that is often, and correctly, seen as disrespectful of women." "This characterization of Ms. Robertson, made during a radio interview last month in the context of the debate over whether the Federal Reserve should be independently audited, was inappropriate, and I apologize," he added. He was roundly criticized by members of both major political parties for the comment, with Democratic Rep. Anthony Weiner asking, "Is this news to you that this guy's one fry short of a Happy Meal?" But until now, Grayson has stood by the comment. "Let's be clear about the context," Todd Jurkowski, Grayson's spokesman, said earlier today. "The attack was on her professional career, not her personal life." "She attacked the Congressman and his efforts to promote a Republican bill to audit the Federal Reserve," Jurkowski said of Robertson. "She actually questioned his understanding of the difference between fiscal and monetary policy. She had the audacity to attack a Congressman who used to be an economist. She's a career lobbyist who used to work for Enron and advocates for whatever she gets paid to promote." K Street is where many Washington lobbyists work, and "K Street whore" is a derogatory – though not uncommon – phrase used to describe them in the nation's capital. Just a few months ago, Grayson was a Florida House freshman with virtually no national name recognition. But he burst onto the scene in September when he suggested on the House floor that the Republican health care plan is "to die quickly if you get sick." Called upon to apologize for those comments, Grayson instead apologized to "the dead and their families that we haven't voted sooner to end this holocaust in America." Last month, Grayson told Hotsheet that "people like a Democrat with guts." His campaign has regularly sent out releases trumpeting Grayson's fundraising – it says he raised more than $250,000 in the first three weeks of October – and potential opponents seem to be shying away from challenging Grayson even though he is a House freshman from a swing district.